The major challenge is the length; an average of six minutes per track to be more precise. That being said it is a solid record, and the title couldn't be more apt. Quite lovely really, there's some wonderful work here and I love the vocals too. For the most part the length of the songs somehow doesn't bother me, although it is a bit much once or twice. Sehr schönes Album mit sphärischen Klängen vorwiegend aus Gitarre, Synthis und Piano. Die harmonische Atmosphäre ist der rote Faden dieses Albums, getragen vom melancholischen Gesang des Frontmanns. 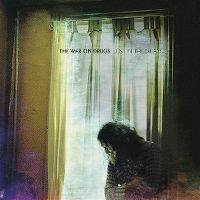 Nach dem ausgiebig gefeierten Meisterwerk "Slave ambient" (2011) erschien nun das dritte Album der aus Philadelphia stammenden Band The War On Drugs mit Lost In The Dream. Rund um Sänger Adam Granduciel spielt die Band eine Mischung aus Americana, Folk, Rock, Blues und Indie-Rock um den jungen Leuten von heute zu zeigen, wie richtige Musik noch funktioniert. Die sympathische Wall of Sound aus Synths, Gitarren und Percussions schaffen Platz für psychedelische Riffs und das symptomatische, langgezogene Murmeln von Adam Granduciel, das sich irgendwo zwischen Bruce Springsteen und Bob Dylan einordnen lässt. Das neue Album ist ein Hörgenuss in den man sich hemmungslos vertiefen kann und der seinen Höhepunkt im zweiten Song Red Eye als strahlendes Feuerwerk in den nächtlichen Himmel abfackelt. Doch damit ist noch lange nicht Schluss. Denn Adam Granduciel schreibt Songs, die sich über eine sehr lange Zeit erstrecken können, dabei eine große Anbaufläche bieten und diese letztlich mit großartigen Visionen in ein malerisches Gesamtkunstwerk verwandeln. Holzbläser, Synthesizer, akustische Gitarren und Klavier zwischen den dominierenden Trommeln und Granduciels Stimme dazu. Ein Hörgenuss. Das im Gesamten beste Album der Band bisher. I would not do this album or this review justice unless I prefaced it with the fact that this is my favourite album of all time. Had it not been for the Godsend that I randomly heard 'Red Eyes' on JJJ in early 2015, my life would have surely been worse without this album. I have only known Lost In The Dream for a short 2 years, yet it has already been with me through the toughest of times and through the most joyous moments I've had. Supposedly influenced by a post-tour depression suffered by Granduciel in 2012, this album is a real emotional journey that I was swept into from the first listen. Having been through similar periods myself, this already made the album relatable and very personal to me as I explored the nuances of the lyrics and the music. Indeed, the lyrics are powerful alone - exploring themes of loss, the burden of living, and suffering. Even exploring philosophy and the questioning and discussion of life, existence and its meaning depending on which interpretation you take. All this stemmed from Granduciel's fascinating existential depression. As I journied through various stages of my life, these lyrics enabled me to reflect, think, reconsider and ultimately find peace in a stressful lifestyle that struggled to find free time to relax and spend time alone. However, the lyrics are only the icing of the cake. Lost In The Dream has been only one of two cases in my life where after hearing a single only a few times, I decide to go straight to the entire album and I insteadly love all of it from the first listen. This is because the soundworld created by the music is one I feel like I have not heard in a long time. The '80s-style Rock, Americana and Bruce Springsteen instantly hark emotions of nostalgia and the associated feelings of nostalgia - which are different yet highly individual for each person. Flashbacks of my life are suggested as I listen to this album, from childhood joys to adolescent angst, to the loss of life, to personal success and everything inbetween. I hear tinges of American country mixed with pulsating synths, with driving rock songs combined with warm and beautiful saxophone solos, all culminating to create this atmosphere that allows this contemplation, peace and nostalgia. Such is the amazing style that I also often imagine driving into the country on dark lonely nights, or see myself journeying across the American Deep South in harsh heat, or sitting in front of a lonely house as an old man remembering his youth. Such is the magic of this music that everyone will have a different yet valuable experience with it. I earlier described this "an emotional journey," and another selling point of this album for me is not only because of the associated experiences I have with this, but how the tone of Granduciel's depression is depicted throughout the songs as the album progresses. The reflective but upbeat and motivating "Under The Pressure" sets a very strong opening mood for the album with a joyous final chorus before descending into an eerie and settling fade out. "Red Eyes" is even more upbeat and evokes a feeling of happiness that I associate Granduciel to also be experienced while he was on tour before the depression kicked in. The atmosphere instantly changes as Adam and the listened enter the darkness with the decisively sombre "Suffering." Despite its fast tempo," An Ocean In Between The Waves" is a time I interpret as the long moments of helplessness, indecision and loss often associated with stress and depression as the music keeps developing and building but never settles or resolves. The tension is built up over 7 minutes until it all cuts suddenly and the album descends into the penultimate "Disappearing." My favourite track on the album, I feel this track is defining, climactic moment of Lost In The Dream. Sitting exactly halfway during the album, I relate to these lyrics as Granduciel contemplating death. Likewise with "An Ocean..." the music chugs along, but this time with little purpose or direction. A harmonica solo comes in halfway through, evoking an image of a lonely farmer/cowboy sitting outside his ranch alone. The mood becomes more upbeat but reflective when "Eyes To The Wind" comes in, before the album descends into eeriness again with "The Haunting Idle." It is following track 7 where I feel the album and Granduciel turning a new leaf, where the closing 3 songs bring tinges of hope, in light of what has happened. What I do enjoy is that they all still evoke feelings of reflection, of looking back on what has happened and thinking about it. After the emotional depths explored in the middle of the album, this could be a sigh of relief, or a sense of simple content that one grew in experience and is alive to look back and contemplate. What has particularly made the above effective is that the vocals are far from the prominent musical feature. Often the instrumental takes over and takes the attention for remaining few minutes of the song. The case is more the instrumental is the main feature and the vocals are the accompaniment. An uncommon dynamic that excels here. "Lost In The Dream" is an album of journeys and emotions condensed into one emotional but epic hour. It is a true masterpiece of art to those that discover it. A true gem that I recommend to everyone. But I do highly recommend you listen to it in a peaceful environment, as it is only a true experience if you go through without distraction. To respond to the other reviews on the site, the track lengths are great - as each song is fleshed out and allows the listener to really sit and listen and reflect - something you never really get with a song less than 4 minutes. Do not let the individual song ratings distract you; this album is perfect as a whole.